Fabulous Adirondack Motel Lodging Near Gore Mountain! Ski Packages, Getaways & Ideal Adirondack Family Vacation Fun! At our cozy Adirondack motel in North Creek, NY, you can plan a weekend getaway or a full-fledged Adirondack family vacation! We offer comfortable, casual lodging options for all types of getaways. Contact us or call (518) 251-2451 for more information. Our accommodations are moderately priced, incredibly comfortable, and located in the heart of the beautiful Adirondack Mountains. Consider us for your next conference, meeting or retreat in Upstate NY, not to mention your Adirondack wedding, honeymoon, or romantic getaway! It’s easy to request more information – we look forward to hearing from you! $50 gift card for dinner at your choice of any local restaurant. $15 gift certificate to barVino Wine Shop to purchase your choice of wine or sparkling wine. Looking to rekindle the romance with your special someone? Look no further. Join us in the heart of the awe-inspiring Adirondack Mountains, where you can pamper your love in one of our Adirondack style guest rooms. $50 gift card for dinner at any local area restaurant. $15 gift certificate to barVino to purchase your choice of wine/sparkling wine. A Seasonal Flower Arrangement with a personalized card from you – just provide your message! Get married right here under the Gazebo in the backyard or in front of the fireplace in the Great Room! Just tell us when you would like your ceremony and bring your New York State marriage license. 1 or 2 nights lodging in a Standard King Room or a Luxury King (with gas “wood-stove” and jaccuzzi tub). Officiant and Witness for your ceremony. Bottle of sparkling wine to toast each other with. Take a whitewater rafting trip through the scenic Hudson River Gorge for a most memorable adventure. The trip takes you through virgin wilderness whitewater thunders alongside 500-foot granite cliffs, and through awesome rapids. The Hudson River’s whitewater is most powerful in the spring; rafting is more moderate in summer/fall. Scheduled whitewater dam releases assure terrific rafting fun all season long. 1 or 2 nights lodging in a Standard King or Standard Double with Twin Room. Full days guided trip down the Hudson River. Transportation from the Rafting Company base to “put-in”, and from “take-out” back to the base. Lunch on the river or back at Base. Stay overnight in a standard king room with continental breakfast, meet your guide for a hike in to OK Slip Falls, feel the energy of the falls and have lunch, descent to your raft awaiting and float down the rest of the magnificent Hudson River to the take–out. $459/couple. NOTE: Raft out must take place on a Tuesday, Thursday, Saturday or Sunday. Come and spend the weekend with us and plan for a day overlooking the majesty of the Southern Adirondacks on the Gore Mountain Gondola. You can spend the day riding the mountain; taking in the breathtaking scenery and hike one or more incredible self- guided trails that surround you. From above or below, we know that you will find the perfect spot to enjoy a delicious picnic lunch. Two-nights lodging in a Standard King or Luxury King room. Picnic lunch for two on the day of the gondola ride. Two tickets for the Gore Mountain Gondola. Ride the rails with Revolution Rail! 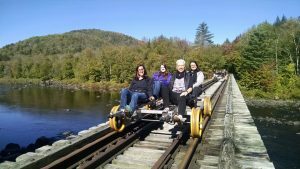 Ride the Railbikes at the area’s newest attraction. Enjoy the scenery along the Hudson River with an easy 6.4 mile round trip on either a double or a quad specially built railbike. It’s easy for all ages to pedal. Make your reservation for the rail bikes directly with http://www.revrail.com! Then give us a call to book a room with us directly to receive a 10% discount on your stay! 1-night stay (Saturday nights require a 2 night minimum stay). Call to make your reservations DIRECTLY with Revolution Rail- they are booked in advance! Plan your next getaway at The Alpine Lodge in North Creek NY!